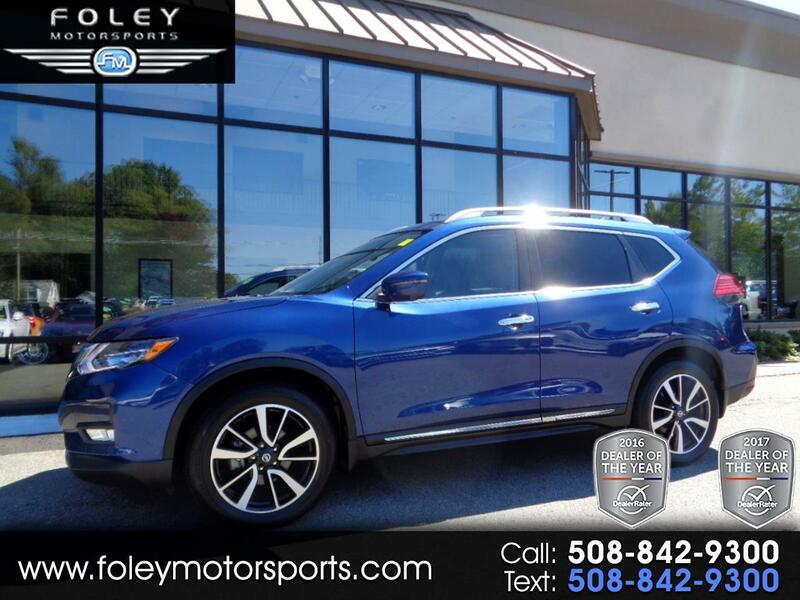 ***Nissan Rogue SL AWD Sport Utility*** SL Platinum Package, Nav, Pano, Leather, LOADED, Like NEW!! 2017 Nissan Rogue AWD SL Sport Utility... Caspian Blue on Platinum Reserve Leather Seating... LOADED... SL PLATINUM PACKAGE... ADAPTIVE Cruise Control... Rearview CAMERA... BLIND SPOT MONITOR... BLUETOOTH Hands Free... DUAL ZONE A/C... HEATED Mirrors... HEATED Front Seats... LANE DEPARTURE Warning System... NAVIGATION System... PANORAMIC Sunroof... BOSE Premium Sound... REMOTE Engine Start... Like NEW... Nissan BUMPER to BUMPER Warranty... ONLY 7084 Miles!! Please feel free to contact our experienced sales team with ANY questions or to schedule a test drive. Buy with confidence from the area LEADER in Pre-Owned LUXURY. Additional 5 Year/100K Extended Warranty Coverage Available. ALL of our vehicles are meticulously detailed and serviced by our factory trained certified technicians. Call or email us at sales@rjfoley.com **$0 Down** 100% financing available with great rates! Trades are always welcome. National and International shipping quotes are available. *We do our very best to make sure our content is up-to-date and as accurate as possible we accept no responsibility for any error or omission. Foley Motorsports provides this service and materials without representations or warranties of any kind either expressed or implied. Prices do not include additional fees such as government fees and taxes, title and registration fees, finance charges or dealer doc fee ($299). Proud to be named 2015, 2016, 2017, 2018 and 2019 CarGurus TOP Dealer Award Winner... 2015, 2016, 2017, 2018, 2019, DealerRater Consumer Satisfaction Award Winner... 2016 and 2017 DealerRater DEALER of the YEAR in the used vehicle category for Massachusetts.